Busbud has added coverage in Alberta’s bus network with the help of Red Arrow and Ebus. With popular routes servicing all of Alberta’s popular hubs like Edmonton, Calgary, Red deer, Lethbridge and Fort McMurray, Ebus & Red Arrow offer great travel options for students, tourists and residents alike. Red Arrow is known as being more than just a transportation company. They are part of each community they service. Their recognizable black & white coaches are reputed as safe, friendly and trustworthy with Albertans since 1979. 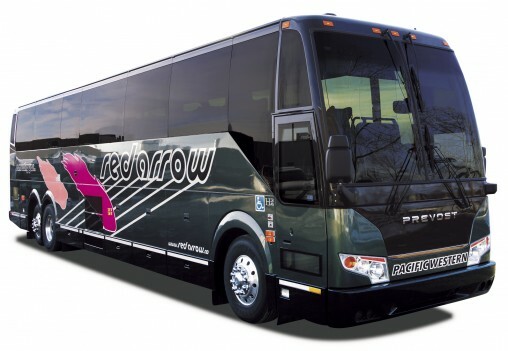 Offering premium service aboard their buses, Red Arrow gives users options like single row privacy seating, reclining leather seats, free Wi-Fi, power outlets and three-point seatbelts for safety! Other favourites include on board movies and, of course, the complimentary snacks and beverages. Ebus offers an extensive network of scheduled routes for reliable transportation across the province of Alberta, specializing in service to and from Edmonton, Calgary, and Red deer. Ebus provides all travelers with the options of economical, efficient and safe transportation. Whether you are looking to book travel, or even just want to make a shopping trip to CrossIron Mills, Ebus offers Alberta coach service to fit a variety of inter-province transportation needs. And no need to worry! You can stay connected the whole time! Their busesare equipped with free Wi-Fi, power outlets, an onboard washroom and extra leg room.